Language is an amazing concept. Somehow, we have the ability to comprehend thousands of words and an infinite number of sentences constructed by billions of people. Sure, miscommunications arise often—at times people are not interested in trying to understand what others are saying—but for the most part, language provides a common wavelength for all to talk, explain, discuss, argue, and share. Yet, language can be quite limiting when similar terms are applied to radically different things. For instance, the term “fabric building” (or fabric structure) has existed for decades to describe any permanent or temporary structure utilizing fabric cladding for its roof and sidewall exterior. The phrase has always been used broadly, but today it covers a wide array of applications and engineering styles, to the point where “fabric building” is not an adequate description. 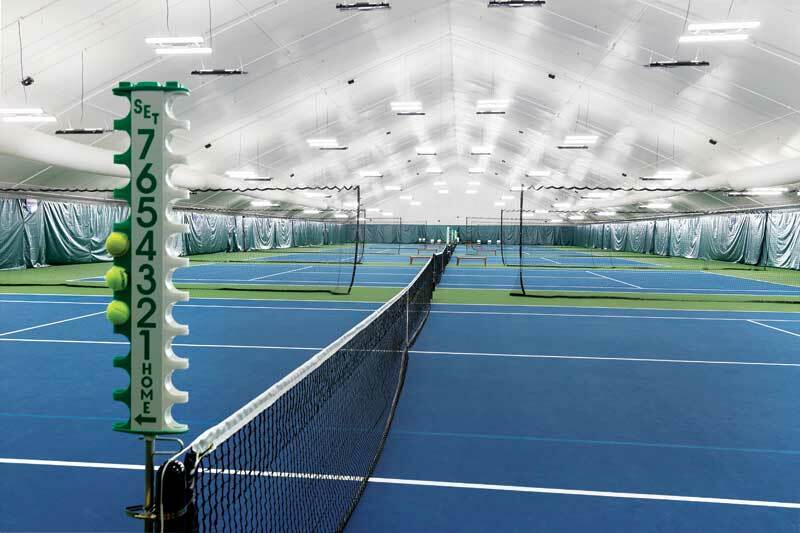 For the purposes of this article, fabric building refers to any code-compliant structure Canadian Standards Association (CSA) S367, Air-, cable-, and frame-supported membrane structures, defines as a “frame-supported membrane structure.” Such buildings today range from simple hoop structures suitable for a backyard carport to permanent ones employed as world-class sports facilities. The materials used on the building’s construction, including the fabric and frame type, determine the building’s purpose and practicality. Both aspects have recently benefitted from game-changing innovations brought forward to the market. For starters, there is the architectural fabric itself. Fabric roofing has been known to provide a multitude of benefits. While the fabric itself contributes only a negligible R-value, the roof’s high solar reflectance and thermally non-conductive properties contribute to keep it cooler than a conventional roofing system. At the same time, many fabrics offer a degree of translucency allowing sunlight to permeate the inside of a structure, effectively providing natural daylighting, and reducing the need for electric lighting in many situations. Fabric’s permeability is also a natural fit for addressing building applications with high humidity (e.g. grain storage) and inherent corrosion risks such as environments used for salt or fertilizer storage. However, the word “fabric” when used in the context of a building is still a mystery for many. One of the most common questions from the uninitiated is around the issues of strength and durability; after all, how can fabric withstand severe weather events or just general wear-and-tear over a long period of time? Fabric’s strength can be seen in everyday examples like trampolines, or through more dramatic demonstrations like driving skid loaders across suspended sheets. A simple example to help explain fabric strength is a backyard trampoline, a toy, which holds up well under constant duress—whether it is a hailstorm or a family gathering where children, small and big, bounce up and down for hours. 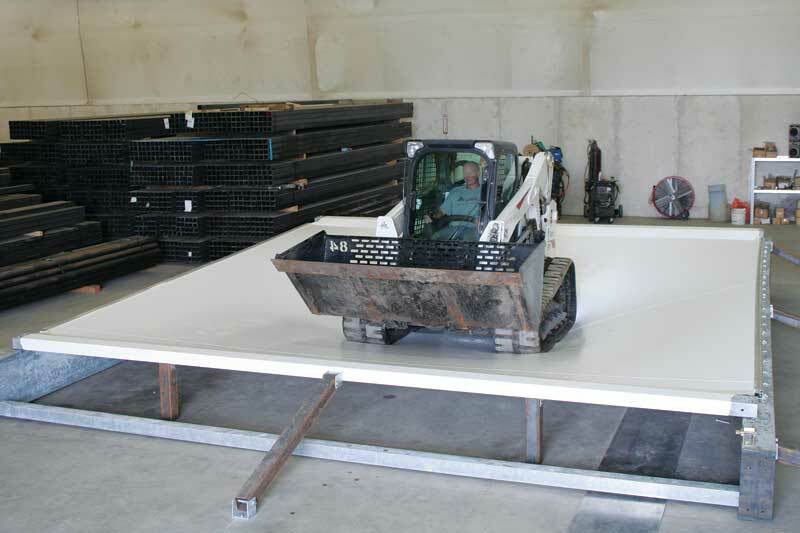 Fabric building suppliers have even taken to more dramatic demonstrations of strength, such as driving skid loaders across suspended sheets of material, a feat no one would ever dare attempt on comparable structures with metal sheeting, which is weaker in comparison. Still, not all engineered fabrics are equal. typically carries a 15-year warranty. Another common fabric is polyvinyl chloride (PVC), which generally has been the go-to material for high-end projects such as athletic complexes, military structures, and certain industrial facilities. PVC has higher tear strength than PE, as it contains a heavier, longer-lasting yarn. However, there is a corresponding higher cost as well or, at least, there was. An advanced PVC fabric was introduced to the market in 2017 with the goal of providing high strength and performance while remaining cost competitive with PE products. A standard PE fabric comprises three layers—a scrim layer containing the weave and a primer coating layer on the top as well as bottom to seal in the scrim. The advanced PVC is similarly constructed, but with seven layers—a high-strength woven fabric in the middle, primer layers applied to each side of the base fabric, and then a topcoat layer (the actual PVC gives the product its shape and flexibility) is added to both sides. Lastly, a lacquer layer goes on the top and bottom to seal the fabric, deliver a smooth and slippery finish, and provide more durability. Independent testing has shown this advanced PVC fabric to have more than twice the tensile strength of traditional PE material, and it retains the strength after years of exposure to weather. The fabric is self-cleaning and has up to 12 per cent translucency.